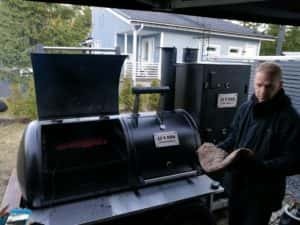 Last weekend I was learning American BBQ techniques at JJ’s BBQ Camp in Finland. My goal was to understand dynamics of offset smoker and get more familiar with kamado cooking. Both goals were achieved. 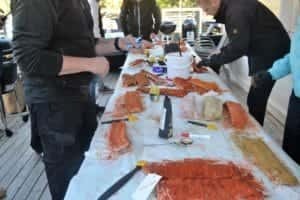 JJ´s BBQ Camp was organized by a Finnish entrepreneur manufacturing reverse flow offset smokers and providing BBQ catering services. Company is still young but creating awareness fast. We were a group of twenty people and some of the members participated the camp already last year. Great team! 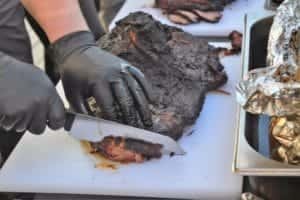 Event started on Saturday morning at 5:00am when we kicked off large smoker and placed some 40lb of briskets inside. Right after that we ignited another smaller smoker and started cooking flank steak for a breakfast. I have to say I was very motivated as we had some four hours of smoking before we got to eat first meal. As the day went by we also cooked Aberdeen Angus burgers in kamados. That was one of the best experiences for me. 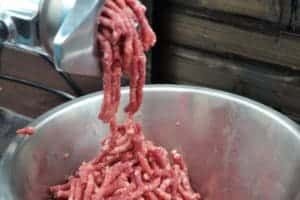 I did not have any idea how big influence good quality meat has on great burger. I know better now. Numerous side dishes and both, beer and wine tasting were part of the day one too. First day ended around 9:00pm and I was ready to hit the sack, stomach full and ready for the second day starting at 6:00am. Second day was a rib and pulled pork day. In addition, some fish and beef in skewers were cooked also. I had cooked pulled pork earlier but again, excellent quality meat and good temperature control took me to next level. You just cannot cut corners if you want to have a great result. Second day lasted until 5:00pm and all the meat we could not eat at the camp, was packed for everyone to take back home. There was plenty. This BBQ Camp exceeded my expectations in so many ways. The team we had was great. All BBQ enthusiasts and eager to learn more. Our pitmaster was excellent host and guide, having time for everyone’s questions. Variety of meat cuts and cooking methods was excellent. It is still hard to believe how many different things we completed in two days. I think we were busy throughout the days but then again, it did not feel like it. Atmosphere was relaxed and everyone was having fun. Every eighteen men and two ladies. Yes, we also had two ladies in a team. Week after I tried my new skills on smoked pulled pork. Great story! I participated the course also and i can relate your comments!